This is truly a once in a lifetime opportunity to purchase an exclusive and a very unique riverside property. This immaculately and scenic 928sqm landholding with beautifully maintained grounds will deliver any purchaser an exclusive family lifestyle in this world-class location. 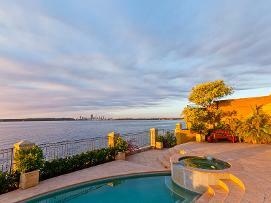 The home offers breathtaking picture perfect views across the entire Swan River Estuary and City, spread over four levels this home provides a secluded sanctuary of timeless quality and total privacy. A fabulous collection of oversized apartments, close the to the city and train and all transport. One, two, three and four bedroom apartments available.